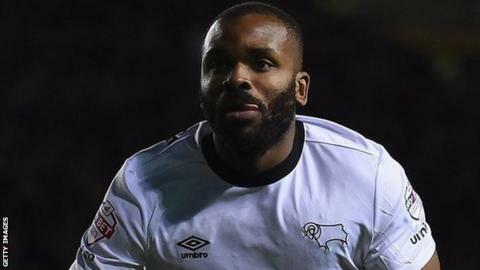 Derby County moved up to second in the Championship after Darren Bent's second-half brace saw off a resilient Blackburn Rovers side. Bent, on as a second-half substitute, latched onto Ryan Shotton's long throw to steer home the opener. His second came from close range in stoppage time after Chris Martin's initial shot had been saved. The victory moves the Rams level on points with leaders Bournemouth, but behind them on goal difference. The top five teams in English football's second tier are now separated by only two points. The double takes Bent to three goals in three appearances for Derby since signing on loan from Aston Villa. Derby goalkeeper Lee Grant denied Chris Brown and Tom Cairney a second-half leveller as the hosts dominated for long periods but struggled to break down the Rovers defence. It means Blackburn, who surprisingly left striker Jordan Rhodes on the substitutes' bench for most of the game, have only one win from their last nine Championship matches and are now 11 points adrift of the play-off places. Despite reaching the fifth round of the FA Cup, Steve McClaren's Derby will remain focused on securing a top-two spot and automatic promotion to the Premier League. Derby manager Steve McClaren: "Some people arrive in the box and the ball never finds them, but Darren Bent is a genuine finisher with the skill and composure to snap up chances. "He could have gone somewhere else and had an easy time with a guaranteed starting place. But he chose to come here and fight for a place in a good team and he has given us the different edge that we needed. "We had to dig deep because Rovers are a tough, strong, direct side but I thought our attitude was absolutely tremendous." Blackburn manager Gary Bowyer: "It was a close game settled by two bits of shocking defending and two bits of Premiership-class finishing. "Derby are a terrific team with a great manager and a brilliant set-up. But we matched them for most of the game and then gave it away with bad defending." Match ends, Derby County 2, Blackburn Rovers 0. Second Half ends, Derby County 2, Blackburn Rovers 0. Corner, Derby County. Conceded by Matthew Kilgallon. Goal! Derby County 2, Blackburn Rovers 0. Darren Bent (Derby County) right footed shot from very close range to the centre of the goal following a fast break. Attempt saved. Chris Martin (Derby County) right footed shot from very close range is saved in the centre of the goal. Assisted by Mason Bennett. Offside, Derby County. Chris Martin tries a through ball, but Darren Bent is caught offside. Corner, Blackburn Rovers. Conceded by Chris Martin. Substitution, Derby County. Mason Bennett replaces Jamie Ward. Attempt missed. Corry Evans (Blackburn Rovers) right footed shot from outside the box misses to the right. Assisted by Markus Olsson. Foul by Ryan Shotton (Derby County). Craig Conway (Blackburn Rovers) is shown the yellow card. Jamie Ward (Derby County) is shown the yellow card. Attempt blocked. Craig Conway (Blackburn Rovers) left footed shot from outside the box is blocked. Assisted by Matthew Kilgallon. Attempt blocked. Omar Mascarell (Derby County) right footed shot from outside the box is blocked. Assisted by Chris Martin. Hand ball by Jordan Rhodes (Blackburn Rovers). Attempt saved. Chris Martin (Derby County) right footed shot from the left side of the box is saved in the centre of the goal. Assisted by Darren Bent with a headed pass. Substitution, Blackburn Rovers. Jordan Rhodes replaces Grant Hanley because of an injury. Attempt blocked. Chris Martin (Derby County) right footed shot from outside the box is blocked. Assisted by Will Hughes. Corner, Blackburn Rovers. Conceded by Lee Grant. Attempt saved. Chris Brown (Blackburn Rovers) left footed shot from the centre of the box is saved in the bottom right corner. Assisted by Joshua King with a headed pass. Delay in match Grant Hanley (Blackburn Rovers) because of an injury. Corner, Blackburn Rovers. Conceded by Omar Mascarell. Attempt blocked. Corry Evans (Blackburn Rovers) left footed shot from the left side of the box is blocked. Assisted by Joshua King. Goal! Derby County 1, Blackburn Rovers 0. Darren Bent (Derby County) right footed shot from very close range to the bottom left corner.